Sign up at QueenVegas Casino on our site to be able use the promos and coupon codes listed below. Cashout Time: eWallets up to 4 hours, Credit/Debit Cards up to 24 hours, Bank Transfers up to 72 hours, Cheques 7 business days. QueenVegas Casino has been designed to treat its players like they’re a part of her royal court. What this means is that you can expect some incredible entertainment as well as bonuses at this 2011 online casino that is powered by SkillOnNet and owned by Caspo Ltd. Casinos. Licensed and regulated in Malta, Denmark, Germany and the UK, QueenVegas online casino has worked hard to create an online gambling destination that appeals to a wide range of players with various tastes and expectations. The online casino has many player friendly features including fast payouts, daily bonuses, no wagering on free spins and hundreds of games from top developers. Safe and secure, you don’t need to worry about your private information and funds transfers at QueenVegas.com as you are protected by SSL encryption technology. You can also expect fair gameplay, responsible gambling and 24/7 multilingual support as you enjoy slots, table games and more. 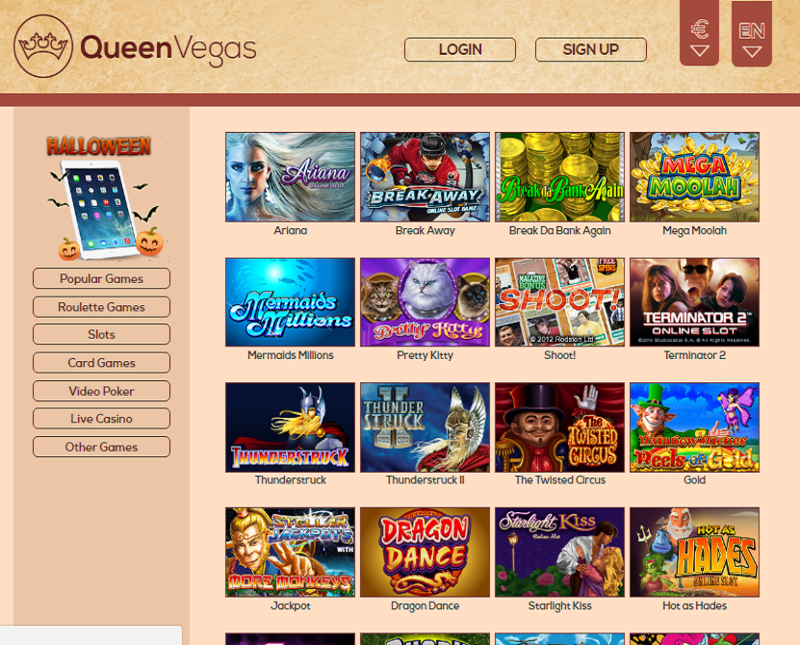 You’ll find an array of brilliant QueenVegas Casino games. They include slots, video poker, roulette, card games and a live casino among others. All games can be accessed through Instant Play (Flash) – no download required – and via the QueenVegas Casino mobile app. The mobile platform is available for Android and iOS. Play your favourite games whenever, wherever via your tablet or smartphone. Games are powered by several of the industry’s best software developers including: Microgaming, NetEnt, SkillOnNet, Aristocrat, GVG, Merkur, Amaya, Nyx Interactive, WMS, Barcrest and Bally Technologies. The live casino, which features live games of blackjack, roulette and baccarat is powered by Evolution Gaming. Want to sink your teeth into some juicy slot action? You’ll find top games like Steam Tower, Medusa, Rainbow Riches Pick’n’mix, Hot Wheels, Koi Princess, Immortal Romance, Wild Crystal Arrow, Mermaid Millions, Terminator 2 and Mega Moolah. Multiple variants of roulette and exciting card games like blackjack, baccarat, poker, and casino war are also waiting to be enjoyed by you. There are also other games like Hi Lo, Doubles Heaven and The Big Wheel. Whatever you’re in the mood for, you’re likely to find it. What you’ll find in this QueenVegas Casino review is that this caisno has plenty of treats for its customers. Signup at QueenVegas Casino and you can start your experience off with a 100% up to £100 first deposit bonus plus 25 free spins on the SkillOnNet 3D slot Ninja Master. From there, you can get 50% up to £150 bonus plus another 50 Free Spins on Ninja Master. Use bonus code: QVBONUS when making both deposits (terms and conditions apply). You also have the opportunity to get reward every day with Daily Picks. If you log in every day to your account and head to your Daily Picks section you will have the chance to claim 1 of multiple offers. These offers change daily and may include anything from free spins to mega spins to deposit bonuses and more. Another QueenVegas Casino bonus is its VIP Lounge. All players are welcome to join and can advance through the 6 levels by accumulating VIP points by playing their favourite real-money games. Points can also be converted into cash and this cash is free with no wagering requirements attached. You will gain more exclusive rewards and perks the higher your level. These perks may include Cashback for every bet you make, big bonus offers, faster payouts, etc. The cashier at this online casino is truly impressive. They offer over 30 banking options including credit and debit cards, prepaid cards, bank transfers and several eWallets. They also have instant deposits and offer same day cashouts on many of their payment options. 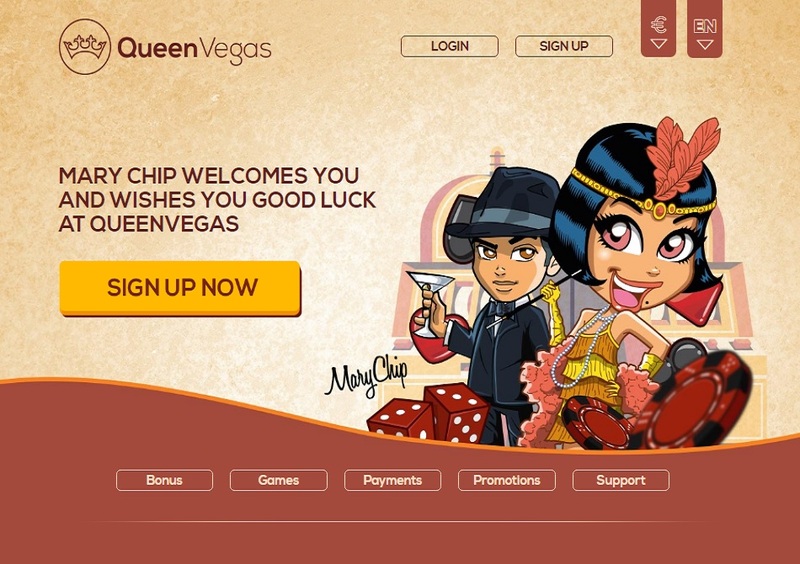 Some of the QueenVegas Casino payment methods include: Visa, MasterCard, Paysafecard, Giropay, Neteller, Skrill, Puggle Pay, PostePay, Yandex Money, Poli, Webmoney, etc. Not all deposit options can be used for making withdrawals. While QueenVegas offers multiple currency options, their main three currencies include Euros, British Pounds Sterling and Us Dollars. QueenVegas Casino customer support is available 24/7 and is multilingual. You can get in touch with their customer support team via live chat, telephone and email. There is also a detailed FAQ section if you would like to take a self-help route. QueenVegas Casino has supported play on mobile platform, you just hold your smartphone at the image area to get the direct link to QueenVegas Casino on your mobile. QueenVegas Casino has restricted from United States, but you can choose another casinos to play from your country.